For decades, Washington state health officials have warned that swimming in or drinking from lakes containing high levels of microcystins is dangerous, but little is known about the effects of eating fish from waters contaminated with the liver-damaging toxins. 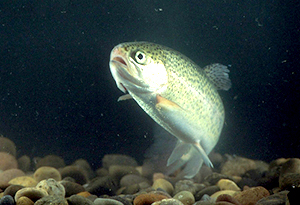 As the warming effects of climate change and runoff from farms and industrial projects contribute to rising levels of microcystins in lakes across the Northwest, scientists in the School of the Environment (SoE) launched the first-ever study to assess whether Washington freshwater fish are accumulating enough microcystins to be hazardous for human consumption. 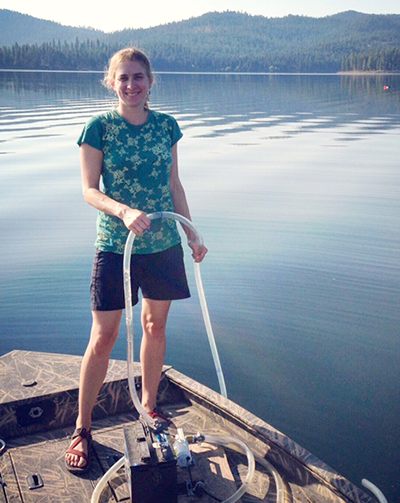 Preece collecting water samples at Twin Lakes, Wash. Working with the state departments of Health and Ecology, SoE doctoral student Ellen Preece and her advisor, Associate Professor Barry Moore, analyzed rainbow trout, largemouth bass, yellow perch, and other common freshwater fish from eight lakes where significant blooms of microcystin-producing blue green algae have occurred in recent years. Seven of the lakes are near Puget Sound. The other, Long Lake, is just outside of Spokane. 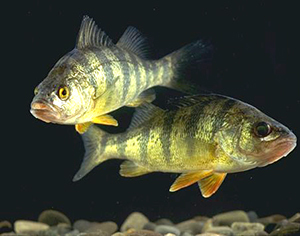 The research team team found microcystins in the livers and other tissues of freshwater fish, but the detected levels of contamination were not enough to pose a significant health risk, the WSU and state scientists concluded in their study published in Environmental Monitoring and Assessment. In the health assessment contained in the study, the researchers referred to the American Heart Association’s safe fish consumption guidelines of eating no more than eight 4-oz. fish meals per month for a child, or eight 8-oz. fish meals per month for an adult. Microcystins and other cyanotoxins are produced by blue-green algae, which thrives in freshwater lakes with high water temperatures and excess nutrients, such as nitrogen and phosphorous. Outbreaks or blooms of blue-green algae are attributed to a growing amount of sewage, fertilizer, detergent, and animal waste getting into lakes. The blooms look like a layer of green sludge on the water’s surface and can occur year round but are usually seen in the summer or early fall. 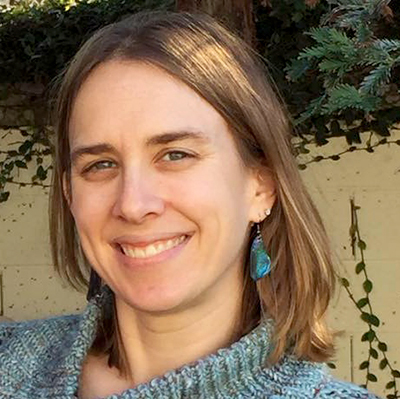 The highest microcystin concentrations in fish that Preece and her colleagues studied were found in a rainbow trout from Anderson Lake, but the levels were well below the human safety threshold, she said. In a related study, Preece, Moore, and colleagues in the state health department confirmed, for the first time, that microcystins produced in Washington freshwater lakes are making their way to Puget Sound where the toxins were detected in some marine mussels. Although contamination levels they found were relatively low, Preece said that eating mussels and other shellfish containing microcystins could pose a greater health risk than eating freshwater fish because people tend to eat the entire mussel, including the liver where most of the toxins are absorbed.